Bride Redemption - old tradition thatI came from the time of Russia. Previously, she was a real agreement between the parents of the girl and the man who takes her married, and had a financial nature. Redemption of the bride in a modern style - it's a fun idea, a performance which organize girlfriend culprits celebrations. To ransom was wondering for a long time remembered by the participants, you need the original script. Below we consider the modern medical scenario bride price. 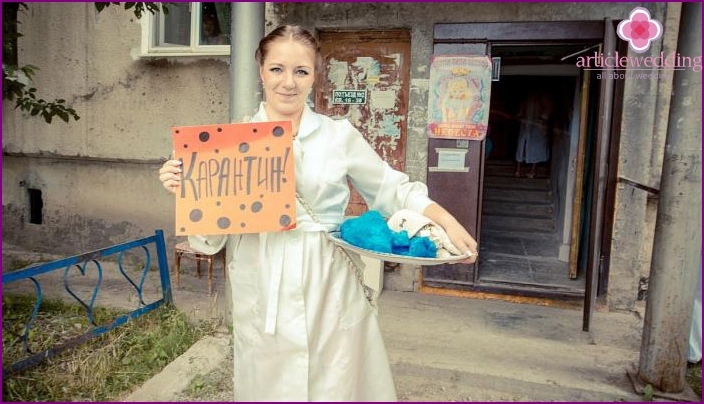 For the modern bride price should beprepare in advance - to collect props, distribute the roles between participants learn the text, decorate the room. Does it matter where the redemption is carried out - in an apartment or private house. Medical ransom demands ingenious approach, the leading artistic. This original game will help the groom with the bride to relax before the celebration, get a charge of positive energy. Subject clothes. Well, if the clothes are the leading white robes. If you currently have should be stethoscopes, and other devices for the examination of the patient. 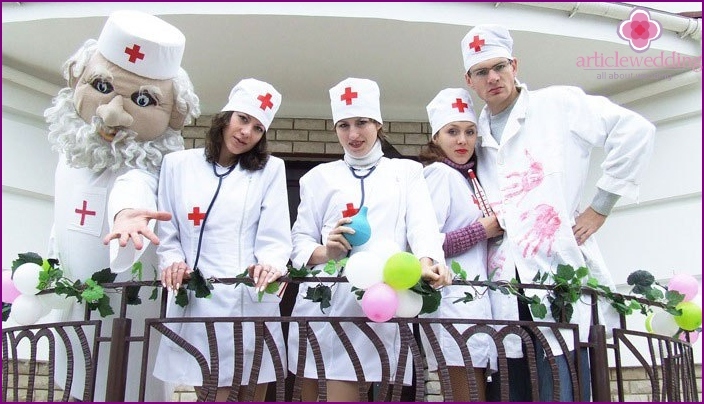 doctor costume can be decorated with a sense of humor - to add a huge syringes filled with colored liquids, red crosses. To look for this equipment, suitable for children "Set doctor". It takes as "delicious" props - juice, carrot. The protagonists of contemporary redemption -doctors, played bridesmaid. They can be male, so it will be fun if the girls will put even a mustache, glasses. First the groom will meet the chief doctor - therapist, then he will have just three physicians - ophthalmologist, neurologist, ENT. Also for the bride price will need a nurse. The room is the entrance to the modern redemption wherethe groom will take a medical examination, should be in a hospital-style. 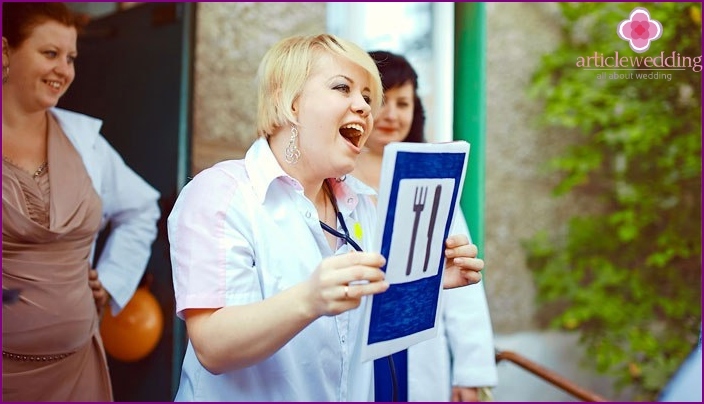 Organizers can get posters, which are commonly found in the clinic, and can independently draw themed pictures, write funny phrases and hang them on the floors. For example, it may be these words: "Do not put your fingers in the socket," "Jam stick together!" And others. "Classrooms" Physicians should be marked with signs. In front of the entrance you need to hang a huge sign "Quarantine". When the bride arrives to the entrance, the culprit celebrations meets therapist, which is under the sign. - Hello, young people! What complaint? - To the bride arrived! - I wonder how something. And we have quarantined, you can not go just like that. Before you go, if you please be disinfected (from a syringe doctor watered groom sweet juice, then notices a nearby witness)! You, young man, too, need to carry out the procedure (witness therapist pours some vodka). 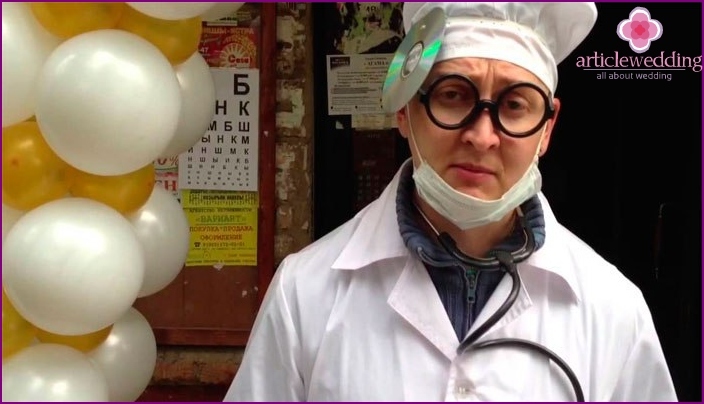 - Wow, you are not all right with health! Not only as you are exposed to anguish. 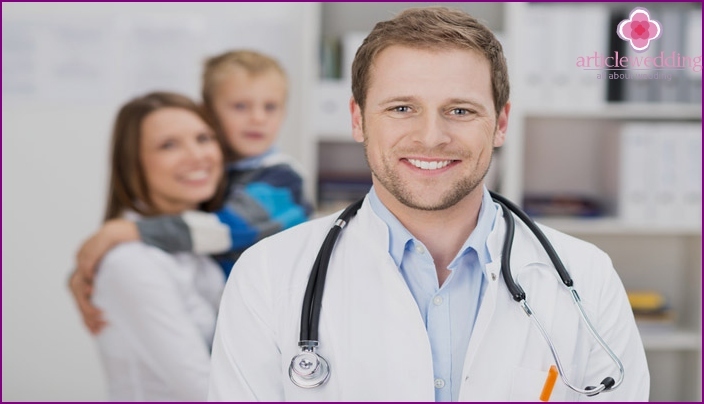 To identify the disease have to be examined by the best doctors in our clinic. Please pass. Therapist gives witness to the groom direction and opens the door for him. The future husband stretches direction from the therapist. - Understand-I-yatno, check the eyesight! Come on, show how accurate you are. 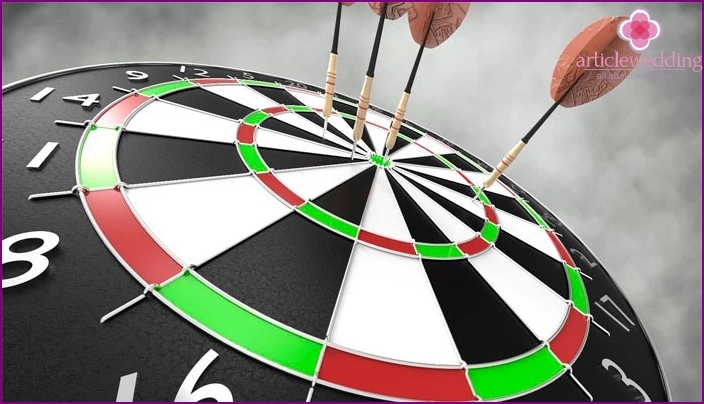 Close one eye, then the other, alternating throw darts. - I am not satisfied with the result, I see that there is adeviation. It is necessary to write it on your card (he writes something on paper, stretches back to the future wife). I'm not sure, but I've got a small outline. It seems to me that your diagnosis - chronic love, it obscures your eyes. Take carrots for visual acuity. Optometrist holds a carrot, the groom with the witness sent further. - Are you nervous? Let's check it out. Neurologist hammer checks reflexes (knock knee), listens for a pulse. - A young man and you draw? Perhaps professionally? - So it's great news! I suggest you go through interesting test to check the memory. That piece of paper, that's a pencil, but the armband, so you could not srisovat portrait of a nurse (standing next to a nurse dressed in the best tradition, the future wife blindfolded). Now draw your bride! - Yes, you are not an artist. Well, love - my diagnosis. Go ahead, everything is clear! - Hello, young people! What complaint? Any complaints? - There are no complaints. - Meets the groom. - Like any complaints? Come open the mouth (throat ENT examining, snorts). Well, in the view of all the good, let's see how it sounds. To sing a song, and you (turning to the witness), sing along, you will be backing vocals. Check your tonsils. Participants tightened love song, prepared in advance. After the assignment of ENT diagnosis puts the last - the love and the rest of council convenes doctors. - Well, we all agreed, yourdiagnosis - chronic love! To overcome this disease is impossible. Do you still spend a lifetime with the bride to melancholy attacks do not recur. Let's go to it, and wish to have treated it alone! - Dear bride, your husband wasserious physical, where we found all the signs of infinite love. Unfortunately, it can not be cured. Here are some tips you as its eternal Matron: do not forget to do it daily artificial respiration favorite feed only delicious, wholesome food, and keep peace in the family, in order to maintain the level of happiness. Attacks of anguish - no joke! After the speech-therapist redemption ends with the bride and groom can go to the registrar. Redemption of the bride in a modern original style -it is, first and foremost, a game that aims to make the wedding day the bride and groom even more fun and joyful. To view was a success, all the participants of the event should be clearly aware of their role, to be able to beat them interesting, so girlfriends, actresses must first spend a few rehearsals. What other ideas of modern bride price you like? Share in the comments.